The 5.56mm/.223 Remington is America’s cartridge just as the AR 15 rifle is America’s rifle. The rifle is used for recreational shooting, competition, varmint hunting, medium game hunting and personal defense. The same rifle will handle all of these chores, given a skilled shooter. While the rifle is versatile and may fill each role well, no single loading will serve in every pursuit. The .223 often fragments. Be certain to consider the likely scenario when choosing a load for a specific duty. Sometimes the choice is confusing. The primary difference in loads is bullet weight. Some weigh as little as 35 grains, loads for long range use may top 80 grains. (There are 7000 grains in a pound.) The light bullets are designed to quickly and humanely dispose of a varmint weighing a few pounds. 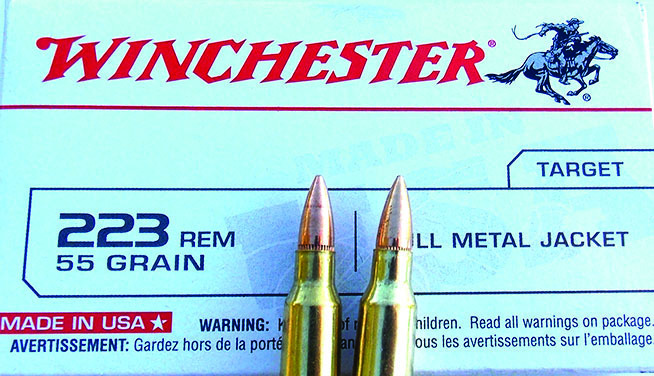 The heavy bullet loads are useful for hunting larger game or personal defense. The most versatile loads may perform well in two or three roles, but we will find that specialization is a great aid in satisfaction with the rifle. The author has personally tested every load discussed. It wasn’t a chore to fire such a quality selection! There are highly specialized loads such as the Black Hills Ammunition 36-grain Varmint Grenade and others such as the Black Hills Ammunition 60-grain V Max that are versatile. Let’s take a look at some of the better choices. It isn’t possible to cover every choice but we may be able to get the rifle shooter started in the right direction. The loads enumerated have been test fired in the author’s Colt and Ruger rifles. A number were also fired in a long serving Bushmaster carbine. I would wager that over ninety per cent of the .223 rounds fired in America are fired in recreational use, in low stress pursuits. I have fired my old alarm and excursion Colt HBAR for fun, at varmints and at distant targets often over the past twenty years. Winchester’s 55-grain FMJ USA load is a standby of police departments, competitors and savvy individuals. I have settled into the bench in pursuit of MOA accuracy. I have practiced tactical drills. But—it was enjoyable. 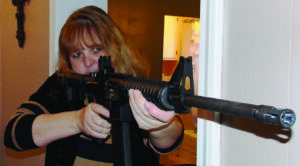 In the event the rifle was called on for real, well, I am very familiar with its capabilities. 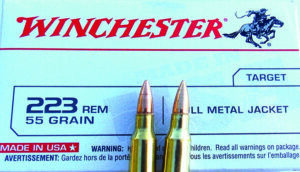 For recreational shooting the best choice is the least expensive quality ammunition available. We all have brand loyalty and Winchester USA and Federal American Eagle may be found for a similar price, but sometimes one or the other may be on sale. This factory generic ammunition using a 55-grain FMJ bullet is the best choice for plinking and practice. I have avoided most steel cased ammunition, and not because it doesn’t function. Two names the author trusts—Black Hills Ammunition and Colt. Foreign powder is often dirty and requires excess effort to scrub the bolt free of carbon deposits. 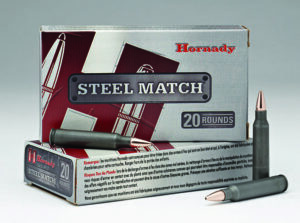 Hornady’s Steel Match is loaded by Hornady and performs as well as most Hornady loads, which is very good to excellent. I now use quite a bit of this offering. The one that is found in bulk at a fair price is the one to choose. If you are purchasing loads in bulk I have found that boxer primed brass is longer lived in storage, versus the Berdan primed steel cased loads. Just in case, in an emergency situation a rifle may be loaded with quality practice ball ammunition and you can expect good reliability. Competition means different things to different folks. Hornady’s Steel Match is an exception to the rule with steel cased ammunition and an excellent all around performer. Three- gun competition demands reliability, and the loads covered in the recreational section will work well. The National Match, of course, would be another thing. The long range stages at 3-Gun demand more accuracy. I have used the Federal American Eagle 62-grain Tip at 300 yards. 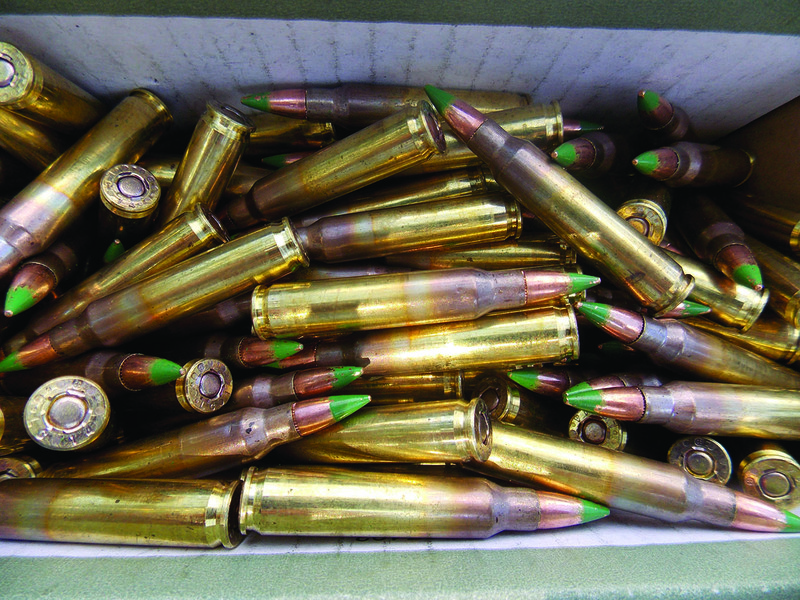 Available in a bulk box, this load would fill the bill at 3-Gun nicely. A number of competitors use the least expensive 55-grain FMJ possible then switch to something like the Black Hills Ammunition 60-grain JSP at longer range. Recently I obtained a number of the Fiocchi Canned Heat loads with the 62-grain FMJ bullet. You simply cannot criticize the packaging. The plastic lid is pulled away and then there is another internal barrier similar to wax paper. Overall, good kit for those that like to keep a ready supply in storage. 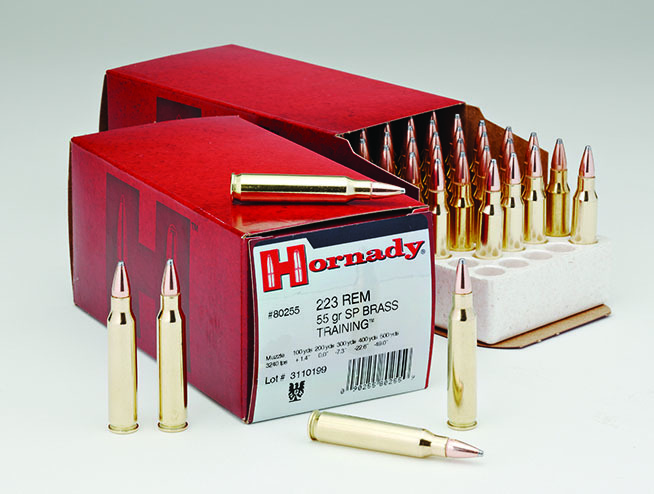 At long range, names such as Hornady and Sierra dominate the field and the hand loads are filled with the individual’s choice of IMR 4895 or Varget. This well used AR is a great home defender. Handloads not only keep cost down they also allow the shooter to fine tune the load. 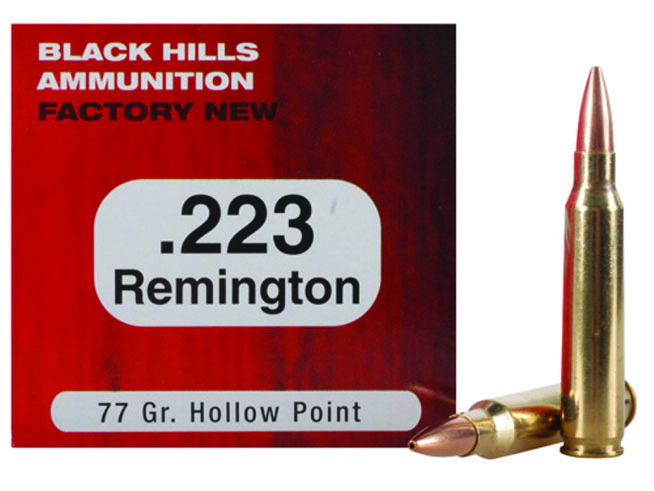 For the rest of us beginning with the Black Hills Ammunition 52-grain MATCH, an old favorite, we have loads capable of cutting edge accuracy. In heavier bullets the 75-grain BTHP as loaded by Hornady is never a bad choice. Long range demands precision. There are several loads that are more accurate than I am able to hold. The Black Hills 77-grain OTM is the choice of the US Marine Corps and other units. Match the load to your rifle and control the trigger. These loads are excellent choices. The centerfire .22 was conceived as a varmint round. We have managed to get much, much more from the cartridge than first intended. Varmint hunting is a great pastime. The skill demanded crosses over into other fields. Steel cased loads may not be the best choice for long term. These are from Russia. Accuracy is important and so is a clean humane kill. Highly frangible bullets are the best choice. These bullets also limit ricochet and preserve public safety. Hornady’s 36-grain NTX is both fast and accurate. I have also used the 40-grain V Max, particularly in the Fiocchi load, and found it clean burning and accurate. Despite the shorter bearing surface in the rifling with this short bullet these loads have given excellent results on targets well past 200 yards. Another favorite is the Black Hills Varmint Grenade. Light bullet loads, heavy bullet loads and military loads function well in the AR 15 rifle. The final choice depends upon the mission. On this subject some years ago a very poor recommendation was made that law officers and home defenders should use the 40-grain .223 based on low penetration and recoil. Some actually bought into this, and the choice is a very poor one for personal defense. These bullets are designed to blow up on a pest weighing a few ounces. 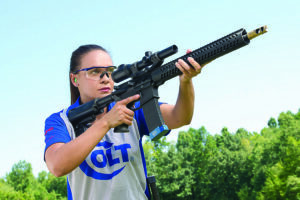 Maggie Reese of Team Colt shows how it is done. 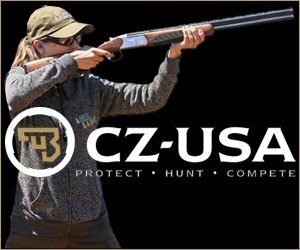 For competition use the primary requirement is accuracy, followed by reliability and affordability in ammunition. The bullet would disintegrate on a belt buckle or heavy clothing. The 55-grain JSP is plenty frangible for home defense! Also, these 40-grain loads sometimes do not function well in service grade rifles, particularly those that have not been well maintained. The 40-grain V Max by Fiocchi and the Hornady 36 -grain NTX each function well in my Colt carbine, but they are varmint and pest loads, not service loads. That being said they are excellent choices for the intended purpose. A close friend has dropped a dozen deer in three seasons with a single shot each using the .223 rifle. His Mini 14 was loaded in each case with the Winchester 69-grain JSP. This loading exhibits an excellent balance of expansion and penetrating. It does not fragment but mushrooms like a .30 caliber bullet. Some time ago I researched the .22 Savage High Power, a high velocity number from a hundred years ago. 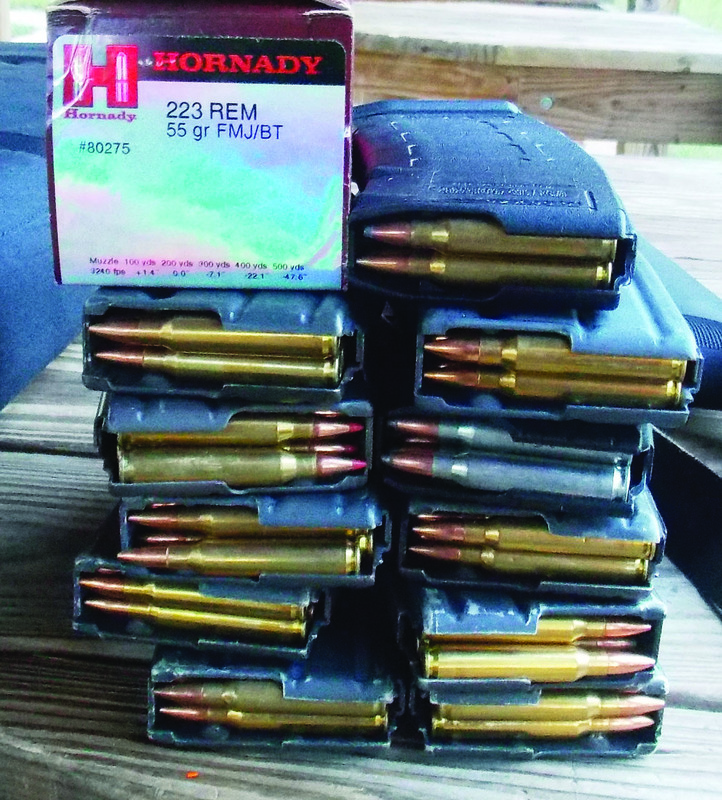 Hornady’s training load, in the traditional 55-grain weight, is accurate in the author’s experience. The reason this caliber was not successful, most believe, was due to a lack of proper bullets for taking game. This is no longer true and the .223 Remington can be a good deer taker with proper bullets. The Winchester Ballistic Silvertip is another good load. These loads expand and hold their weight rather than fragment. Another excellent choice is the Black Hills Ammunition load with the Barnes 55-grain TSX bullet. The .223 is pretty frangible and a good home defense choice. I have also tested the 62-grain TSX from the same maker and find it an excellent all around loading. These bullets simply give the hunter every advantage. 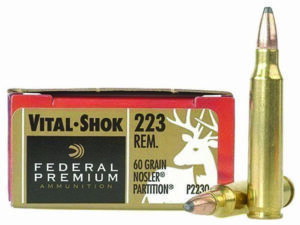 A superbly accurate choice is the Federal Vital Shock 60-grain JSP. This load uses the proven Nosler ballistic tip. Federal has more recently Introduced a 62-grain bonded core bullet with excellent performance. Police shootings usually occur within 50 yards. Most are far shorter. The 55-grain JSP has been used across the board for many years. There are better choices, most of them intended to increase the penetration of the load and decrease fragmentation. Black Hills Ammunition offers the classic 77-grain hollow point in 50 round boxes. As an example some years ago an officer attempting to stop a fleeing robbery suspect fired a single 55-grain JSP into a vehicle windshield. The bullet fragmented in the glass. While the felon bled out, he did so after traveling some miles with a wound from a bullet fragment. Light cover penetration also needed to be enhanced. This is why special teams still rely upon the .308 precision rifle in addition to the AR 15. 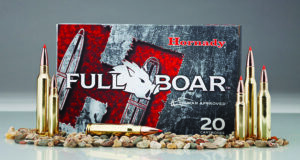 Hornady’s new Full Boar load is fast gaining an excellent reputation in the field. The .223 demonstrates less penetration in building materials and home structures than the common pistol calibers such as the 9mm, .40 and .45. With standard loads beginning with the 55-grain JSP results against felons in the open have been excellent, with a single shot usually taking immediate effect. This is a good thing for public safety. In this regards, practically every .223 55-grain JSP is a good choice. After considerable research I adopted the Black Hills Ammunition 60-grain JSP as my personal standard some time ago and have seen little reason to change. The cartridge is available in 50 round boxes. 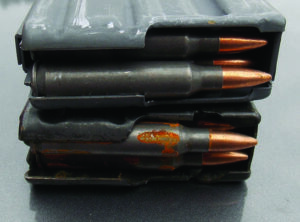 This is Federal’s Green Tip 62-grain, a civilian version of the military loading. 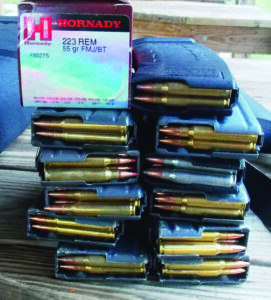 Another solution to the problem is the Hornady 60-grain A Max loading. Available, affordable and predictably effective, this loading is versatile and accurate. I have explored the heavier bullets, particularly in light of the excellent results of the Black Hills Ammunition 77-grain OTM in the hands of our young warriors. These heavy bullet loads are certainly formidable, but for my personal use I think the 60-grain loads are best. Federal Cartridge’s 55-grain Vital Shock is among the few extensively proven hunting loads in .223 caliber. The cartridges and loads discussed are all top quality. I have tested each for reliability, accuracy and ballistic performance. In the end, a loading that performs reliably in your personal rifle and which exhibits good accuracy is important. Consider the level of penetration needed. 8 inches or more is a realistic choice for home defense. (These loads were tested in water, ballistic gelatin results are similar.) The greater penetration loads are suited to deer sized game or felons behind cover or heavily clad, as in the winter.